We are putting Scampy up for sale. A "For Sale" sign will be placed in Scampy's rear window. I gather that you like that. may or may not be of interest to you. I want to do this thing myself. That's joy of it for me! Hi George... you are amazing. You bought your new box van quicker than I can choose new bvd"s in Wal- Mart. Btw, I pull my Silverado 4x4 crew cab behind my 40 ft Class A. Total length with Blue Ox tow bar is 67 ft. Your 36 ft is doable. The higher visibility helps me and I expect you will find it works for you too. Judicially accepting some help in your build out may speed the process and make your changeover just a little easier, especially considering your wrist issue. 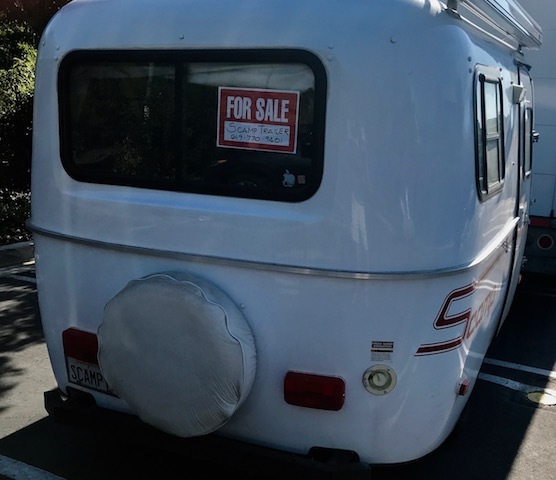 I was only able to make a buy decision quickly because I had spent perhaps 20-hours on the internet and on the phone talking with sellers of box vans over the past week. Speaking about MsTioga. The other day when I was on I-5 on the way to return the rented 10-foot box van, I drove right by where she met her fate! I was not able to know the exact place. But it was about 20-miles south of Bakersfield going south. Good idea. That way you have two entries and exits. Scampy for sale so soon? It may seem soon to sell Scampy. However, as soon as the pass thru is installed, I will begin living fulltime in Box Van. Are you going to do the pass through yourself? If so, be sure to know if there is any flex between the cab and the box. If there is, the construction will be prone to separation and water intrusion. Water has a way of finding even the smallest gap. Good luck. It appears as though other folks who put in a pass thru used Accordion Boot Seal. Click [Here] to view. I was looking into the DIY cab to box passageway and heard about "accordion seals". Learn something new everyday. A grinder with a cutting blade or a sawzall & make the opening, figure some way to protect yourself from the edges. An accordion seal between the box & the cab so they can both still move their own way that will keep the weather outside. I am sooooo sorry! I accidentally deleted your comment. You need to put more pictures up of Scampy! We have captured tons of Scampy pics. 1. Look at the top of our Blog page for the Archives link. 2. Click on the Archives link. 3. Use the "#1 Search Engine" routine. 4. Enter the search term: Scampy. Do you have a price set for the Scamp yet? $14,000 is the price that I paid for Scampy. And I have made lots of improvements since then. $15,000 is the sale price. Good luck with that George. 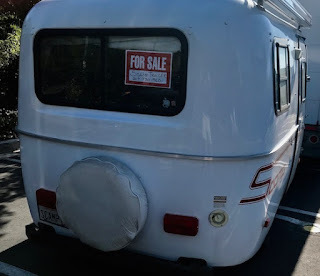 I hope you aren't in a hurry to sell. I did some price checking and I think you'll be lucky to get $10k. Did your checking include taking into consideration Scampy's equipment package? George—I think I am as excited for you as you are to be launching your new venture! I eagerly anticipate each new day with news of what you accomplished today. May you find the strength and determination needed to bring your dream to reality!
" May you find the strength and determination needed to bring your dream to reality!"